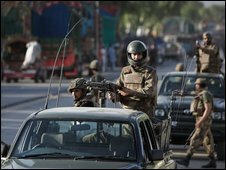 Pakistan's military is stepping up an offensive against the Taleban, after a weekend in which it said it killed 200 militants in and near the Swat valley. It has begun an artillery bombardment of militant positions. The UN refugee agency has meanwhile warned of an increase in the number of civilians being displaced as tens of thousands flee the fighting. A BBC correspondent in Islamabad says the authorities may not have the capacity to deal with the displaced. However, the medical director of one district told the BBC the provincial government was coping well. Meanwhile at least six people were killed and 10 injured in a suicide car bomb attack on a checkpoint near the city of Peshawar. One paramilitary soldier was among those killed at the Spintana checkpoint near the tribal town of Darra Adam Khel. Most of the injured were also security personnel. No-one has as yet said they carried out the attack. Darra Adam Khel has been the scene of several suicide attacks against security checkposts and convoys, and security forces have carried out several operations in the region against a local faction of the Taleban. The BBC's Barbara Plett in Islamabad says the military has been using heavy artillery to soften up the Taleban, which is currently in control of large parts of Swat valley and neighbouring regions. Fighting is continuing throughout Malakand region, which includes Swat, Dir and Buner. Interior Minister Rehman Malik said about 200 militants were killed over the weekend, bringing the total killed in fighting in the region to 700, but it is impossible to independently confirm these figures. The government has vowed to eliminate the militants, but our correspondent says this could be a long and difficult battle. Civilians have been taking advantage of the lifting of a curfew to leave violence-hit areas, but our correspondent says security forces are no longer allowing them though. It is not clear whether the government and aid agencies have the capacity to cope with the numbers. Killian Kleinschmidt, deputy head of the UN High Commissioner for Refugees in Pakistan, spoke of some of the difficulties. "The floodgates are opening whenever there's a curfew lifted and, be it in Buner district or the Swat area, ... thousands and thousands of people are on the roads," he told the BBC. "This is of course for all of us a major challenge in helping the provincial authorities to cope with that so we are all trying to rush supplies, which fortunately are available in Pakistan, to the site." Arshad Ahmed Khan, the medical director of Mardan district, called for help from international aid agencies to deal with the problem. "The provincial government is ... providing a very great job to these IDPs [internally displaced persons], including free medicine, free food, even the clothes are provided by the government," he told the BBC. "We are doing our level best and we are catering for the IDPs, but still we feel that now is the prime time that the NGOs, they should come forward and they should take part in this activity." The government says it expects a million internally displaced people. Mr Kleinschmidt said more than 300,000 people had been registered as displaced at camps or registration centres. The militants then moved towards the capital, Islamabad, causing further alarm. Prime Minister Yusuf Raza Gilani has called the conflict a "fight for the survival of the country". Have you been affected by the fighting in the region? Have you been displaced? Send us your comments and stories using the form below.